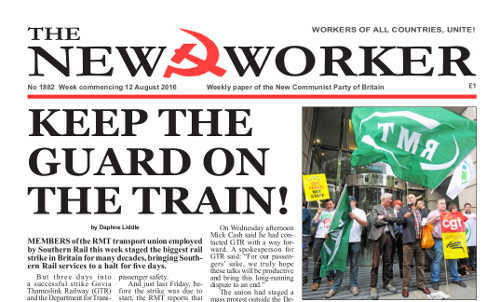 www.newworker.org | 12th August 2016 - Keep the guard on the train! MEMBERS of the RMT transport union employed by Southern Rail this week staged the biggest rail strike in Britain for many decades, bringing Southern Rail services to a halt for five days. But three days into a successful strike Govia Thameslink Railway (GTR) and the Department for Transport (DfT) agreed to return to the arbitration service ACAS for further talks and the RMT transport union suspended the strike as from Thursday morning. The issue behind the dispute is rail safety and in particular the need for a fully trained guard, or conductor, to be on every train and to operate the doors, assist passengers, and deal with incidents and emergency situations that may arise. TWO REPORTS emerged last week of instances of benefit claimants discovering that their negative assessments had been carried out by individuals with extreme racist and xenophobic views. In one case Cecelia Garcia, a young mother of three whose marriage had broken down and who had been forced to leave her banking job to look after her children, received an answerphone message from a member of Department of Work and Pensions (DWP) Jobcentre Plus staff. AUGUST HAS COME round again, the month in which the bourgeois media usually try to fill their columns with silly season gossip now that Parliament is in recess. But this year we have been spared the usual great white shark sightings and forest fires stories because of the furore in the Labour Party that has even knocked Donald Trump’s ravings into second place in most of the gutter press. Court cases, clandestine plotting and the usual Red Scare smears, such as Labour’s Deputy Leader Tom Watson’s ludicrous claim that “Trotsky entryists” have infiltrated the Labour Party to manipulate “young members” and take it to the brink of disaster, have been rolled out in a last-ditch bid to boost Owen Smith’s flagging efforts in the leadership race that the old Blairites triggered in yet another desperate attempt to unseat Jeremy Corbyn. Many wonder why they bothered in the first place. Some say the motive of the 170-odd right-wing MPs is simply to undermine Labour to pave the way for a Tory victory in a snap election next year. Others think that although Corbyn is clearly set for another overwhelming victory this may not have been so blindingly obvious at the time to the Blairites in Parliament who have little or no contact with rank-and-file opinion.